LITTLE FALLS – Finding a rhythm in a field hockey game is a difficult task. Not only are there whistles blown by officials every few seconds, but when players are still trying to jell in new positions, the result is often going to be a slow start as a team needs time to find its groove. That is what Passaic Valley has experienced in its first five games of the season. Even though they had just two first-half goals in their first five games, the Hornets knew that the team was improving rapidly and their breakout was coming. 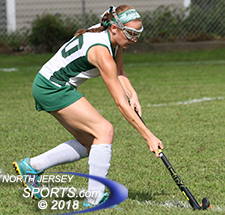 Ashley Martin and Sydney Cummings scored in the first 6:02 of the game as Passaic Valley took control early and remained in control throughout a 3-0 victory over Northern Valley/Demarest in Little Falls on Saturday morning. The engine that makes Passaic Valley go is versatile senior Emily Hyde. She plays a defensive center midfield position but is also the Hornets’ most dangerous player with the ball on her stick. The senior made her presence felt early, beating two defenders along the right side before delivering a centering pass. Sydney Cummings got a touch and Ashley Martin was there to collect it. The junior middie used a reverse-stick shot to sneak it past Norsewomen goalie Danielle Jacobson for her first varsity goal to give the Hornets a 1-0 lead 4:40 into the game. Danielle Jacobson made in saves in goal for NV/Demarest. Just 82 seconds later the Hornets found the back of the cage for a second time. Another dribbling display by Hyde gave her some space for another pass into the middle. Cummings one-timed a low-liner through traffic and inside the left post to make it 2-0. After being bottled up for most of the first half Demarest (0-5) started off the second half strong. 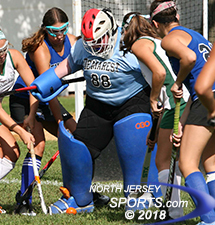 They pushed forward earning their only corner and shot of the game, PV goaltender Kayleigh Keating was there to make the save and the Hornets went back on the attack from there. Sydney Cummings scored Passaic Valley’s second goal. Passaic Valley (3-3) added an insurance goal 10 minutes into the second half. Off of a scramble in front, Isabella Guarente slammed it home for the final 3-0 margin. Zoe Weigele was credited with the assist. Jacobson finished with 18 saves including a nice kick save on a penalty stroke in the second half for the Norsewomen. With games coming up against Dwight-Englewood and Hackensack before a showdown with Lakeland, the Hornets feel like they are starting to jell at the right time.